At convention this last weekend one of the things that I learned is how important it is that we prepare hosts. I have found that when the host is very prepared then the party is more successful. There are a few easy things we can do that will drastically increase our success at parties. 1. Host kits-at the first of each month I make up a packet of things that I want to give to hosts. I usually give these to the host when she books the party. Whenever I give it to her I make sure to walk through each item so she know what to expect and how to have a great turn out. a. Host Letter-this explains the host benefit and what I need to host to do. SR also has an official host letter but I don’t use it. I use the following instead. 1. You will receive 10% of your total party sales (before tax and shipping) in FREE products. 2. You will receive up to $100 worth of products at half price when your party reaches $400 in sales. The amount you receive increases as your party sales climb. 3. You will receive $100 worth of products at half off for each party booked from yours, so encourage your guests to have their own party! 4. 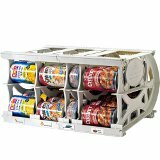 As a host, if you placed an order at a previous Shelf Reliance party you can carry the amount of that purchase to your party. It is called the "Double Dip" benefit. 5. Remember that all Host Benefits are taken at the retail prices. 6. You and the guests who purchase at your party will receive party pricing forever! 7. If you or a guest sign up for the "Thrive Q" monthly budget plan, that amount is not only added to your party sales, it will be multiplied by 3 because you need to remain on it for at least 90 days. If the budget amount is $100 then the total added to your party sales would be $300! 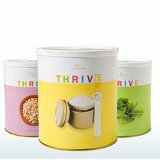 I'll will bring samples to taste made from our delicious Thrive foods. I'll let you provide a beverage. Remind your guests to go to shelfreliance.com to browse our terrific products and bring their wish list to the party. Let them know that party prices are much less than those they will see on the website. Also, I want YOU to browse the website to see what you might want for your free and half-off Host Benefits! c. Invitations: I give each host 40 and tell her that if she needs more then I will be happy to get her more. d. Host Benefit Form: I give this to the host so she can see the scale on the back that shows how to earn ½ off items. I think it helps the host understand how the benefits work. e. Envelope: I put it all together in an envelope. I print back of a 6 by 9 inch envelope, the kind with the clasp. Then if I need to mail it to the host I can still write on the front. I have attached the word document but here is the info I put on the envelope. 2. Personal Contact: -I try to have at least 2 contacts with the host before the party. I must admit that I prefer to e-mail the host (because then I can do it at 10:00 at night and not feel bad). But some f my host prefers to have a phone call. I think I have decided that when the host schedules a party I will ask her how she would prefer to be contacted. So what do I usually do? a. 1 Week Call--I call her 1 week or there about before the party. During this call I make sure she has the invites and that she has filled out the 40 leads in 40 minutes so she can invite 40 people. My aim is for her to have 12 people at each party. b. The Day Before-I call her to get a feel for how many people are coming. I need to know this so will have enough copies of the quiz and price list with me and so I can decide how much food to make. If she has not called the guests I remind her to give them a call. If the host calls the guests she will have a much higher turnout. 3. Follow Up—After a party I try to have it closed two days (depending on when it is) after it is held. So I call the host 2 days after the party to gather any outside order or to see if she needs help figuring tax and shipping. 4. Host benefit orders-when the host has submitted all the orders from the party. I enter them into the back end. Then I pull up her host benefit form and enter any parties that are scheduled. Then I copy and paste the rewards chart into an e-mail and send it to her. With the explanation of what that means. I then call her and tell her the e-mail is there and tell her on the phone what her totals are. 1. Develop a system of how you will prep your hosts. Write it down. 2. Decide what info you will give to a host when you give her the invitations. Make up a few host kits (how every you want them) and put them in you party supplies so you will have them at your next party. 3. Get you March parties scheduled. If you don’t have your calendar set for March now is the time. You girls are great! Keep up the great work! Next week I will be announcing our first team contest so get ready.